Backstreet Postcards: A School or Sunday School? A School or Sunday School? The building behind could be either a church hall or a school. Looking at the children, there is such a variety of ages from two year olds up to fifteen and sixteen year old. 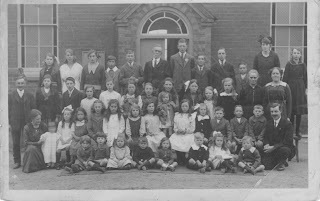 Only the smallest child at the front has moved and is blurred but most have remained still enough to have their likenesses captured.